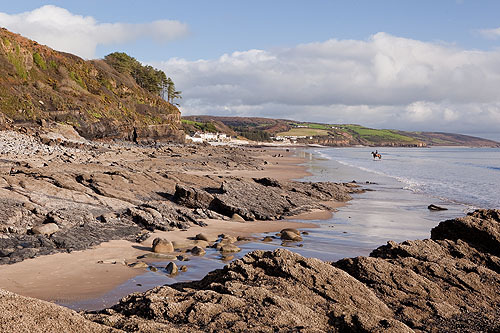 Mining has traditionally taken place in the cliffs near Amroth and as far west as Monkstone. The "Burrows Patch" was the most easterly of four mining "patches" , on the coast , between Wiseman's Bridge and Amroth. Iron ore and coal was extracted from the cliffs , signs of the mining can be seen at beach level and further up the cliff face , where large areas of rock have been removed . Before the mid-19th century, the ore was taken away either in carts or directly loaded onto boats on the shore, with some taken to the Ironworks at Pembrey. Following the opening of the Kilgetty Ironworks at Stepaside in 1849, much of the ore produced was taken there by trams.